In an effort to find solutions for future communications issues, NASA has teamed up with Harvard and TopCoder to announce a series of challenges aimed at creating an internet network capable of transmitting through deep space. TopCoder is the world’s largest development and design community for professionals, which makes this the first crowdsourcing collaboration for NASA. The challenge issued to TopCoder’s members is to aid in development of secure data transfer for communications taking place across vast distances. Essentially, these developers will be searching for a way to make deep space internet private via sender authentication, cryptographic keys, and validation. 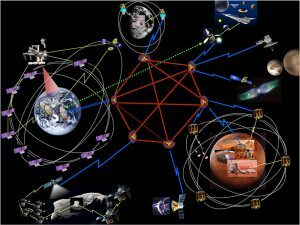 Progress in the field of deep space internet connectivity has already been made by NASA in the form of Disruption Tolerant Networking (DTN). DTN protocols are expected to aide in deep space communication by overcoming the myriad factors which could delay or impede internet connections within the solar system. Without this protocol, internet connections between planets, or from an orbiting spacecraft, could be interrupted by factors such as distance, planetary rotation and interference from stars.